Article36 | Article 36 is a UK-based not-for-profit organisation working to prevent the unintended, unnecessary or unacceptable harm caused by certain weapons. : State participation at the UN nuclear talks – who is represented? May’s session of the OEWG ended with strong support from the majority of the countries present for a new international legal instrument to prohibit nuclear weapons. The majority of the world’s countries – 127 nations – have endorsed the Humanitarian Pledge to fill the legal gap with respect to the prohibition and elimination of nuclear weapons (with a further 22 voting in favour of a General Assembly resolution on the Pledge in 2015). States now look increasingly ready to start negotiations, and turn this support into action. The OEWG, operating on General Assembly rules, is in principle open to the attendance and participation of any state. 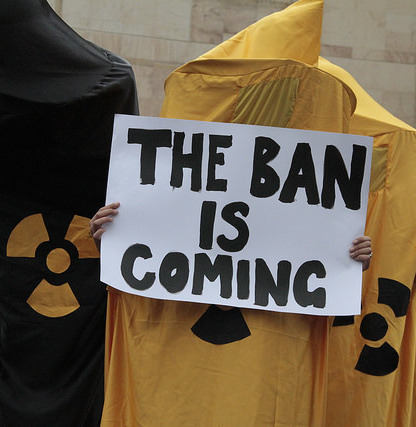 The nuclear-armed states have refused to attend and branded the OEWG exclusionary – with some proposing work in the Conference on Disarmament (CD) as an alternative. However, with a membership of sixty-five that is significantly skewed toward richer and western states, as well as states that possess or depend on nuclear weapons, the CD disenfranchises the vast majority of the world’s nations (as well as having failed to agree on a programme of work for two decades). Nineteen states spoke at the OEWG in February and May that have no right to participate at the CD (other than potentially as observers). The great majority of these states were Pledge endorsers, and included Costa Rica, El Salvador, Jamaica, and Palau (countries that have been vocal with proposals at May’s session) as well as Thailand – whose ambassador has chaired the OEWG. During February and May at the OEWG, data on statements given by individual countries shows that the positions of those who depend on nuclear weapons in their security doctrines may be being heard out of proportion to their numbers (as noted in OEWG Report on 3 May). Nuclear dependent countries made 29% of individual country statements to the OEWG over February and May, despite making up only 14% of countries. By contrast, 59% of statements have been from countries endorsing the Pledge – which make up 64% of nations. These proportions remained similar during OEWG sessions in February and May. 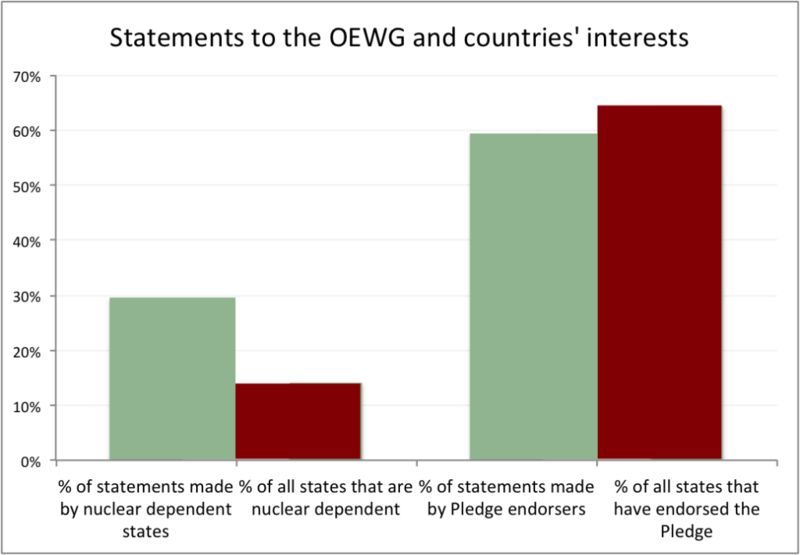 At the end of May’s session, 54% of nuclear dependent states had spoken, but only 29% of states endorsing the Pledge. The proportion of Pledge-endorsing states did increase significantly during May’s session however – at the end of the first day of May’s session, only 18% had spoken. Fourteen Pledge states that had not spoken in February contributed a statement to the May OEWG – all but four of the states speaking for the first time at this session. Looking at the regional distribution of statements made to the OEWG, across February and May 52% of Western group states spoke, and 45% of Latin American and Caribbean states. Only 17% of African states made an individual country statement, with 25% of Asia-Pacific and 26% of Eastern European states making an intervention at least once. Lower-income countries are, in general, underrepresented at multilateral disarmament forums. The lower a country’s income group (using OECD-DAC categories), the less likely they are to be a member of a treaty or forum, to attend meetings, or to speak. At the OEWG across February and May, 15% of low-income countries spoke, 24% of lower-middle income countries, 40% of upper-middle income countries and 40% of high-income countries. Lower- and middle-income countries are also more likely to be members of Nuclear Weapon Free Zones and endorsers of the Pledge. Countries with fewer resources to devote to multilateral disarmament forums face a number of choices and barriers to participation. For the OEWG, countries without a mission (or specialist disarmament representatives) in Geneva will have struggled to attend. The sponsorship programme offered for May’s session will have assisted a small number of states in this respect. 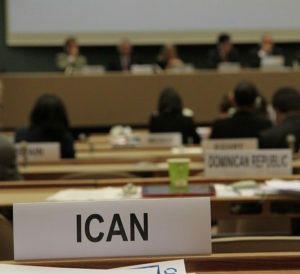 Only one country without a mission in Geneva participated in May’s OEWG, out of nineteen countries and territories counted without Geneva representation – of which seventeen are Pledge endorsers. Countries will smaller missions, where staff must cover a larger portfolio that includes disarmament, will also find it harder to participate. Low-income countries made up over half of the states with missions in Geneva that did not attend the OEWG in May. Of the 81 countries with missions in Geneva that did not attend the OEWG in May, 51 were Pledge endorsers. In May, Pledge endorsers were slightly underrepresented (60% of attendees) and nuclear dependent states overrepresented (24% of attendees) in the proportions of states attending. The Humanitarian Initiative on nuclear weapons has had considerable success in mobilising interest from lower-income countries and world regions that are normally marginalised in nuclear disarmament forums. As progress continues towards the global prohibition of nuclear weapons, issues of representation and barriers to inclusion will continue to require careful consideration. Attendance data is from ICAN’s count of states in the room, statement data from Reaching Critical Will. This article was first published in Reaching Critical Will’s OEWG Report.